The Full Moon is Sunday May 22. Jupiter is visible all evening long. Mars is at opposition on the 22nd. Saturn is close to the red star Antares and forms a triangle with Mars. 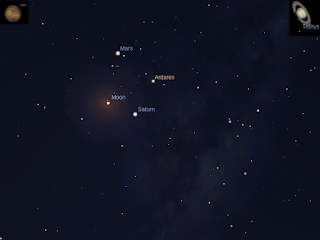 On the 22nd Mars, the Moon, Saturn and Antares from a diamond shape in the sky. 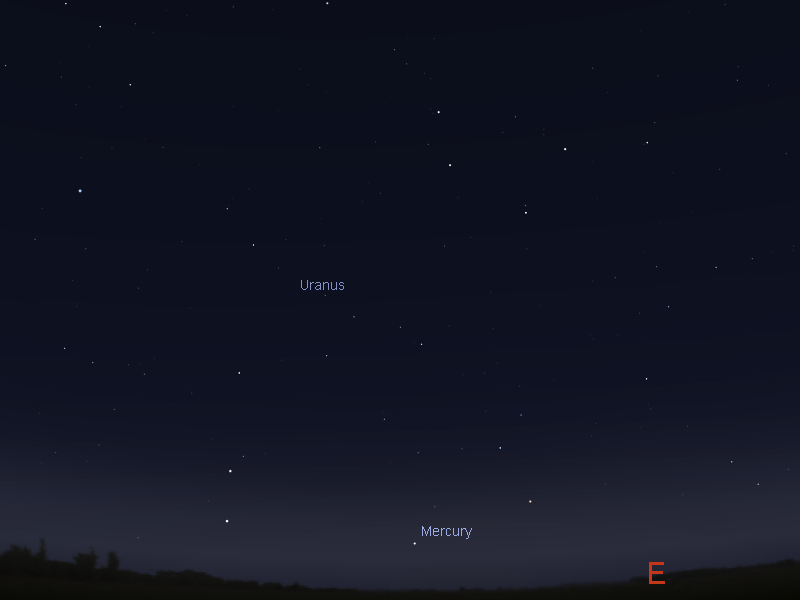 Mercury returns to the morning sky. 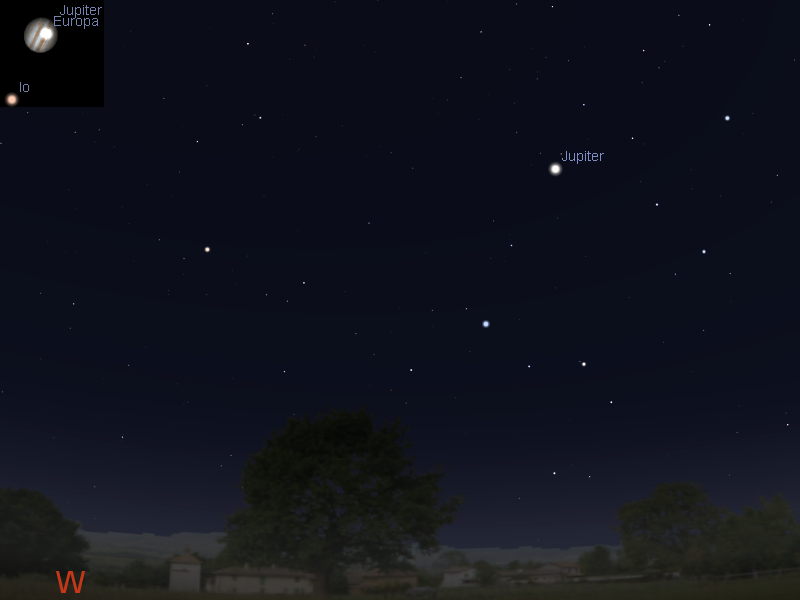 Venus is lost in the twilight.Comet C/2013 X1 PanSTARRS is visible in binoculars in the morning sky. The Full Moon is Sunday May 22. Evening sky on Saturday May 21 looking west as seen from Adelaide at 22:00 ACST. The inset is the telescopic view of Jupiter at this time. Similar views will be seen elsewhere in Australia at the equivalent local time. (click to embiggen). 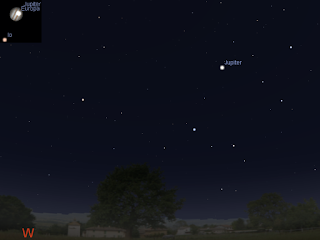 Jupiter enters the evening sky as the sun sets, and is good for telescopic observation from around 18:00 on. Jupiter's Moons will be an excellent sight all evening. On the 21st Io crosses Jupiter's face around 18:00, then its shadow, then finally Europa at 22:00. The evening is also graced by the summer constellations of Orion the Hunter and Canis Major with bright Sirius, the dog star above the western horizon in the early evening. Evening sky on Sunday May 22 looking east as seen from Adelaide at 22:00 ACST. Mars, Saturn and Antares form a triangle. The inset shows telescopic views of Mars and Saturn. Similar views will be seen elsewhere in Australia at the equivalent local time. (click to embiggen). Mars is high in the evening skies in the head of the Scorpion. Mars starts the week in the very head of the Scorpion between the stars Dschubba and Acab. Mars forms a triangle with Saturn and the red star Antares. On the 22nd Mars will be at opposition, when Mars will be biggest and brightest when seen from Earth. It is visible all night long. In even small telescopes Mars will be a visible disk, and you should see its markings. 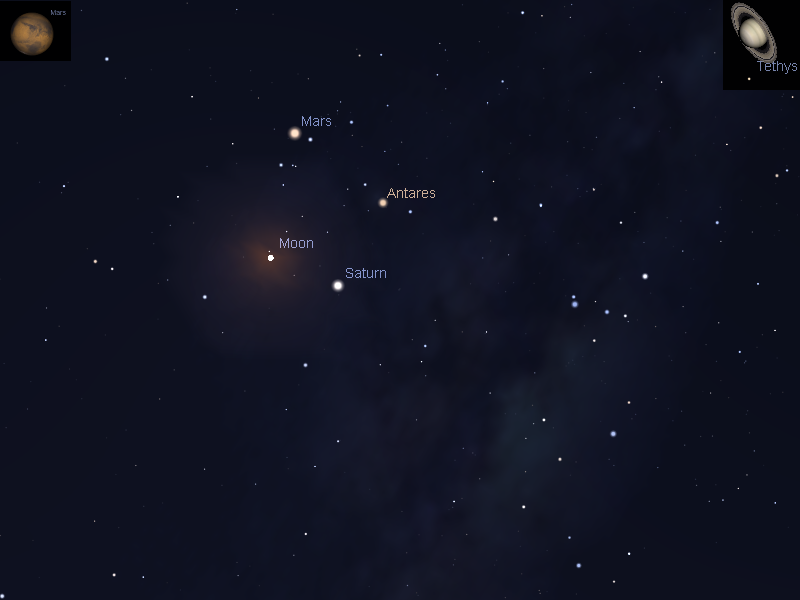 Also on the 22nd Mars, the Moon, Saturn and Antares from a diamond shape in the sky. Saturn is reasonably high in the evening sky and is readily visible below Scorpius. Saturn forms a triangle with Mars and the red star Antares. It is now high enough for good telescopic observation in the evening. Morning sky at 6:00 ACST facing east as seen from Adelaide.Similar views will be seen elsewhere in Australia at the equivalent local time. (click to embiggen). 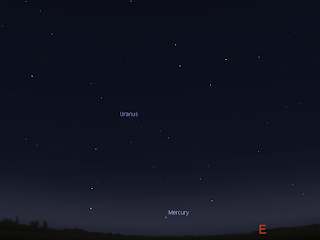 Mercury returns to the Morning sky, and is low to the horizon. Comet C/2013 X1 (PANSTARRS) is now high enough above the horizon murk in the morning sky to be readily visible before twilight. It is currently around magnitude 7. A guide to seeing it is here. Thanks Ian, I'm sure there are lots of people other than me who appreciate your posts ! Southern Skywatch May, 2016 edition is now out!